We are Eric Husken and Jacqueline Bonebakker. 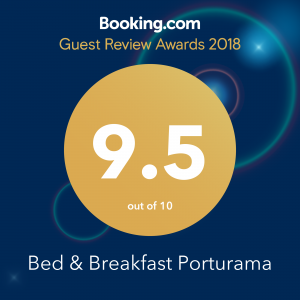 Settled just outside the small and quiet country village of Mouronho you will find our Bed & Breakfast Porturama. The name Porturama is a combination of Portugal and Panorama. When you see the view from our beautiful and peaceful garden to the mountain range called “Serra do Açor” (Hawk mountains) you will understand why. A great setting for a Bed & Breakfast. The garden, the view, the pool and the environment are inviting you to sit back and enjoy. Are you looking for peace then the garden is an ideal place to sit under an olive tree and enjoy the amazing view. Taking a refreshing dive into the pool is one of the other possibilities next to read a book in a quiet corner. With a Vinho Verde for example or a nice glass of Port wine. Also the hiker will find lots to undertake in this area of Portugal. There are numerous appealing small villages to visit that can be reached via windy country and mountain roads. In our spacious garden you will find several ancient olive trees, plums, grapevines, apple and pear trees a tangerine and a fig (The last one does need some TLC in the coming years). The pool is situated facing south-west. The summers can be hot, the large swimming pool, 10 by 5 meters (that’s about 33 by 16 feet for the non-metric people) will be very refreshing then. Nevertheless, in the spring and autumn the evenings can be a bit chilly therefore we advise you to put a small jacket in your suitcase; it might come in handy. On this website you will find lots of ideas how to spend your time. Enjoy reading and we look forward to having you as our guests!